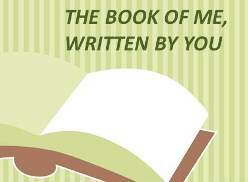 This week's prompt for the Book of Me (an online writing project promoted by Julie Goucher of the Angler's Rest blog) is 'Your Childhood Home'. This was a lot easier for me than last week's rather difficult to pin down suggestion that we write about our favourite season. By the time I was eighteen I had lived in four different houses - admittedly one for only a month or so. I can remember them all quite clearly and have on occasions gone back to visit them, one obviously when we visited my grandparents and the others just to look to see how the area had changed in the intervening years. When my parents married my grandfather allowed them to rent a bungalow that he had bought for his retirement. 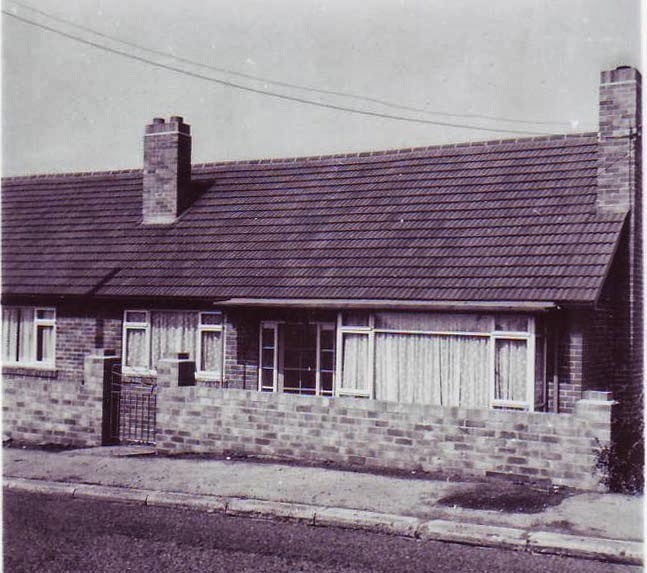 As he'd been a colliery manager he'd always lived in the company houses so buying this bungalow was planning ahead for when he had to leave work. 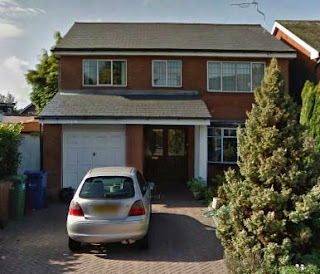 This is the house I lived in from my earliest years until I was about seven years old. It was in a small village called West Rainton a few miles from Durham City. There was an attic room, reached by pulling down a set of steps from a hatch in the ceiling with a long pole with a hook on the end. I remember sitting up there reading my dad's Eagle comics. So that must have been not long before we left in 1968. The large bay window in the photo is the front room, it had a tiled fireplace and there was room for a dining table as well as a suite. My parents had a record player, the kind where you could put 45rpm records on in a stack and the mechanism played them one after another, dropping the next one down on the turntable as each one finished. We didn't have a television straight away, but I remember one later, black and white of course. I think, though I'm not sure, that I remember BBC2 starting, but as that was in 1964 (according to Wikipedia) I'd only be three years old. The kitchen was behind the living room, there was a coal fire with a back boiler for hot water. I remember a larder with a sliding door - my parents kept my asthma inhaler on the top shelf so I couldn't reach it. In those days inhalers were new and dangerous - I was told that if I took too many 'puffs' I would die from a heart attack. I can tell you that when I had an asthma attack the chance of some relief far outweighed the possible danger of dying ... but that's a whole 'nother story. I remember my mum had a zig zag washing line and it was my job to pair up the socks which had been hung on the lower rungs when they were dry. I used to sit on the hearth rug (a proddy rug my mum had made from fabric scraps) in front of the fire to do this. There was smaller formica topped table in the kitchen and I can remember eating fish fingers with tomato ketchup sat at this table. There were two bedrooms. 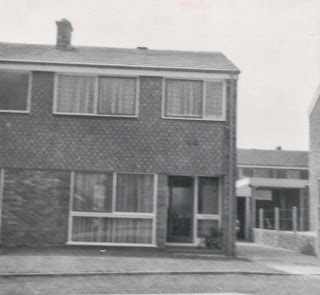 The one at the front was my parents' - they had a Stagg bedroom set, light oak veneered wood, a bedhead, chest of drawers, and two wardrobes. I think my son took the last remaining piece of this set when he set up home by himself nearly ten years ago now, so it lasted well. The back bedroom was mine and later shared with my brother who came along in 1964. We had the 'yellow' beds, huge old fashioned beds that my mum and her sister had slept in as children. My mum still tells me that when family came to visit the children would be put to sleep with so many heads at one end and so many at the other, feet together in the middle. There was a matching dressing table and I still have the stool from this set in my house now. The garden at the back was huge, or at least it looked so to a small child. My mum has always gardened. I remember her growing strawberries. My dad always wanted a garage and we had a big foundation hole dug which gradually filled with stones from the garden. It came in handy on Bonfire Night - 5th November - as a safe place for letting off firecrackers and other more dangerous fireworks. The house backed onto fields where we used to go to pick rosehips for syrup. Looking on Google maps there's a big house there now although the fields still start just one house further on. There are also houses across the road from the bungalow now, where I remember them building a bypass for the village not long before we left. We have some pictures in the album of mum, dad my brother and myself walking along the empty new road before it was opened. Fast, modern living coming to a sleepy village! My dad got a job in the Midlands so we had to move in with my grandparents while he looked for a house for us near his new place of work. My grandparents lived in Whitley Bay in Northumberland by then and were retired. Dad wrote letters to mum all the time and enclosed notes with little cartoons on them for us. I don't think we were there very long, but I did have to go to school there for a while. Whitley Bay is a seaside place, but it was at the beginning of the year and I don't remember going to the beach very much - it was quite a long walk from the house. The house was huge - or so I thought. I suppose it was compared to the bungalow. There were four bedrooms, two very large and two small ones. All the furniture was large and old fashioned. My parent's furniture had to go into storage during this period - it must have been difficult for my mum to have to live with her parents again, especially with two little children to keep occupied and out of the way of her father who was one of those 'children should be seen and not heard' types. His domain was the front sitting room, he would stay in there all day reading - as I was capable of being quiet and I did like reading I would sometimes sit in there with him. There was an upright piano and some bookshelves in that room and a china cabinet with some very fancy old china tea sets that we never used. The suite was very heavy and covered in floral loose covers. The curtains in the bay were silver with a kind of leafy fern pattern, they went from floor to ceiling. In the dining room there was a large table, with leaves that could be pulled out to make it longer when more of the family came for Sunday lunch. There was a black bordered white screen painted on the end wall so that my granddad could show his holiday slides to us. I remember dark wood furniture, my granddad sat in a dining chair with arms at one of the table. There was an Ercol suite in that room too, it later came with my grandma to her bungalow after my granddad died so I remember it from later years. The kitchen had another table and more chairs. The window looked out sideways onto the neighbouring house - there wasn't much of a view when you were using the sink. The door to the cupboard under the stairs was opposite the kitchen door - I remember making poppies from orange tissue paper and wire, we kept the makings in that cupboard. It must have been one of the things mum came up with to keep us busy and out of granddad's way. In the downstairs passage there was a shelf over the radiator - and on the end was a little brass bell. Very tempting for a child - I remember wanting to ring it - I expect I did - probably once too often! The stairs turned on back on themselves to get to the first floor, and on the first little landing, just a couple of stairs up there was a small bookcase - with a set of books by Charles Dickens - a bit too hard for me at age seven, but I read some of them in later years. Eventually Dad wrote to say he'd found a house and we travelled down by train to meet him. It was dark when we arrived and it had been a long journey so I don't remember arriving at the new house. 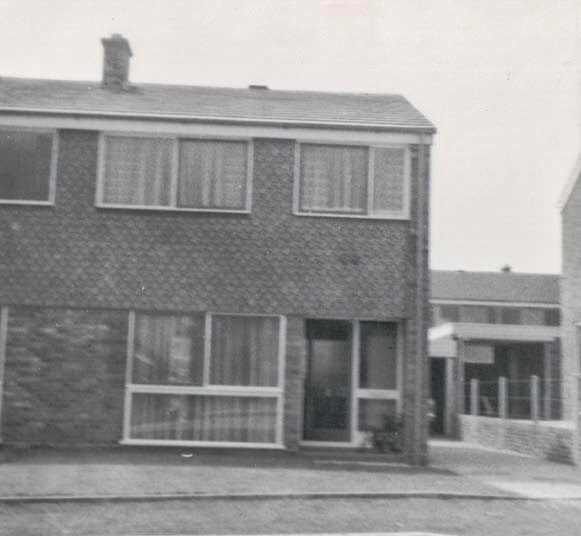 This house was a standard three bedroomed semi-detached on a large 1960s estate. The street it was on only had houses on one side, numbered one to ten, and we faced the sides of a small street of bungalows separated from us by two big patches of grass - perfect for children to play on. I think nearly every house on that street had children all around the same age. There could be groups of ten or more of us 'playing out' in the summer. There were two larger bedrooms and a small one over the front door, that was my brother's. He was only about four when we moved in there, by the time we left my parents joked that they had to move house as he was getting too big for the room! I still had one of the 'yellow' beds and it was far too big for the smaller rooms in a modern house. There was central heating, but I don't remember it being very warm, though that might have been during the 3-day week in the 1970s ... I even remember my mum having to boil an egg over the coal fire in the sitting room as the electricity was off. We had to go to bed with candles and even bath by candle light. Not as nice as it sounds, the bath water might have been warm but the rest of the house was freezing. On the landing between my bedroom and the bathroom was an airing cupboard - there was a hot water tank and shelves above where mum put the clothes after they'd been out on the washing line, but before she put them away in the drawers and cupboards. In that cupboard lived the "Please remember" picture. 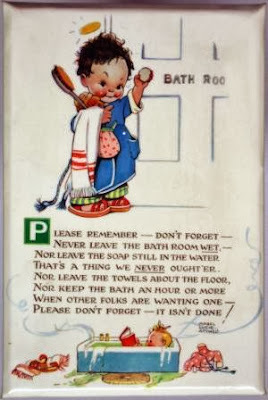 It's a kind of family tradition now, I have one of these in my bathroom and so does my daughter. 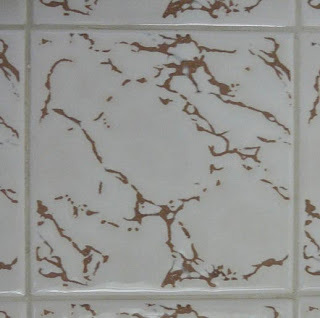 Mum has a newer version still hung on her bathroom wall, the one I remember as a child flaked and crumbled years ago. 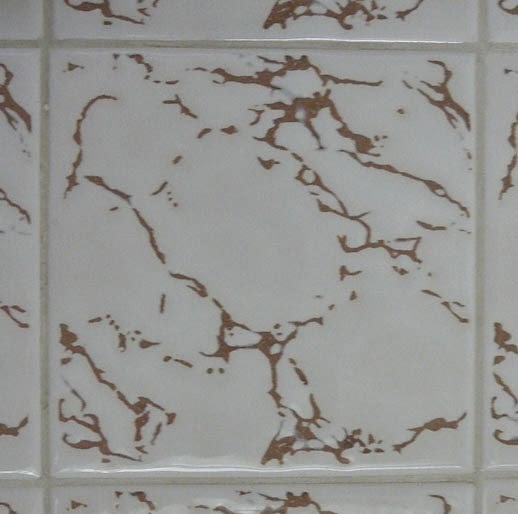 Whenever I see tiles like these now it always brings back memories of that house. The living room had an exposed brickwork chimney breast - mum and dad hung brass plates that they brought back from holidays abroad on it and one of my jobs was to polish them with Brasso. My mum still has the plates - although she hasn't asked me to clean them for her recently! The furniture as the new 'in thing', Ladderax, sectional furniture that you built up in whatever way you wanted with metal or wooden ladders supporting shelves, drawers, cupboards or even small wardrobes. Mum still has all this too! The dining room was separated from the living room with double doors, so you could open the rooms out to make one big space. With the huge floor to ceiling windows at either end it made for a large airy feeling space. My brother and I used to make 'camps' under the dining table and pretend we were in a space ship. My dad would draw us maps of the solar system with all the planets so we could sail off somewhere mysterious where there were green men and monsters! When I was fourteen we moved to a larger house about a mile away. It was a big wrench leaving the street where we had grown up. However we both had bicycles so it wasn't too difficult to go back to meet up with people in the holidays and at weekends. The picture is from Google Maps - I can't find a picture of the house whilst we lived there, but that is probably because I've only scanned my parents' photograph albums up to the early 1970s so far. It was a four bedroom house and the garden was much bigger. My mum grew all kinds of fruit and vegetables and it was a wrench for her to leave it after only a few years. I have some bad memories of this house - well those were my teenage years. I will write about some of them in my private blog post - but not on here. The big move was when I was eighteen - my dad got a job in Doncaster, South Yorkshire. But as I was 'of age' by then I think that might be another story! What great memories you have of places - and yes, I spotted the chicken right away! My first memory is of the second house we lived in - I was only 6 weeks old when we moved there so no chance of remembering the one before. It would have been 1975 and I remember Queen's Bohemian Rhapsody playing on the black & white TV in the living room - odd the things you retain eh! I can still picture exactly how that room looked too - far better than my own bedroom. 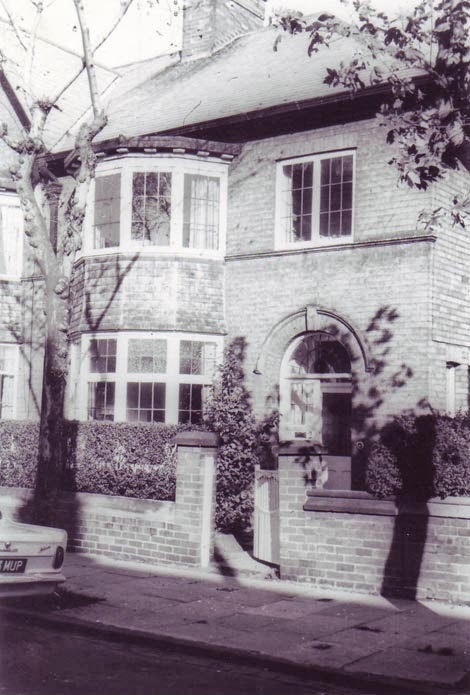 We moved again when I was 5, and i spent the rest of my childhood into adulthood living in that house.